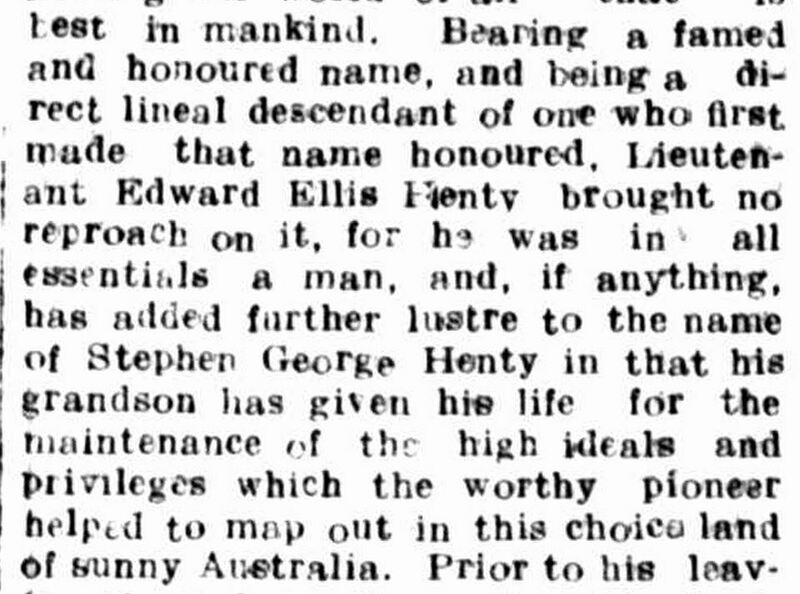 Born on 4 December 1888 at Portland, Edward Ellis Henty was the youngest son of Walter Henty and Annie Campbell. He was also the grandson of Stephen George Henty, who with his brothers were among Victoria’s first settlers at Portland in 1834. Walter Henty and his family spent time at Victoria Valley where he farmed before moving to The Caves near Hamilton in the late 1890s. Edward, known as ‘Ted’, attended the Hamilton and Western District Boy’s College. Once Edward finished school he went to work in a Hamilton bank as a clerk. 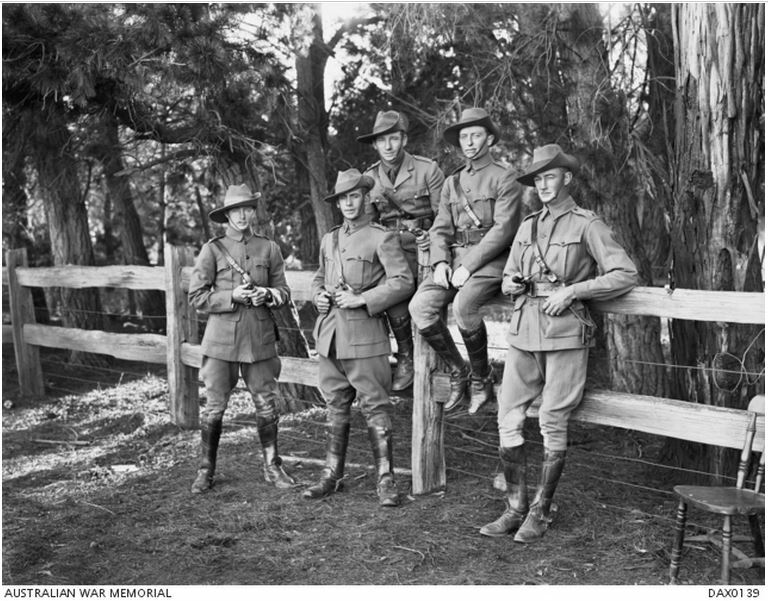 He was also a member of the Hamilton branch of the Australian Light Horse, joining around 1907. He became a commissioned officer and reached the rank of Lieutenant around the time war broke. It was inevitable Edward would serve. His enlistment with the ALH enabled him to apply to leave with the second contingent. On 25 September 1914, Edward received a telegram notifying him he was accepted to serve overseas and his rank of Lieutenant would stand. 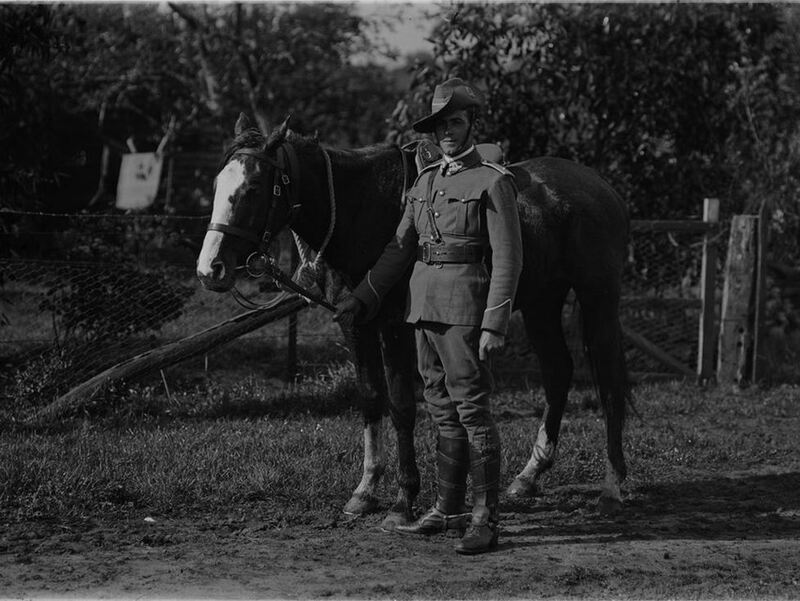 The following Monday, Edward left for training at Broadmeadows with the 8th Light Horse, B Squadron. After around four weeks in camp, Edward noticed the men of the 8th Light Horse were missing out on basic comforts, unlike other men in the forces, with none of the men having received a gift from the public during their time there. Such was his concern, he wrote to the Hamilton Spectator and his letter published on 20 October 1914. Not only did he request donations of warm clothing and some small comforts, he suggested instruments be donated for a regiment band. “SECOND EXPEDITIONARY FORCE.” Hamilton Spectator (Vic. : 1870 – 1918) 20 Oct 1914: 6. <http://nla.gov.au/nla.news-article119869938&gt;. The Spectator published another letter from Edward Henty on 2 December 1914, thanking the people of Hamilton for donating just over £62 toward the appeal. Although the instruments cost almost double what Mr Greed had predicted, Edward advised his troopers contributed money from their pay to buy the instruments. The band’s first appearance was in front of the Governor General. The following photo is of the 8th Light Horse Regiment band. 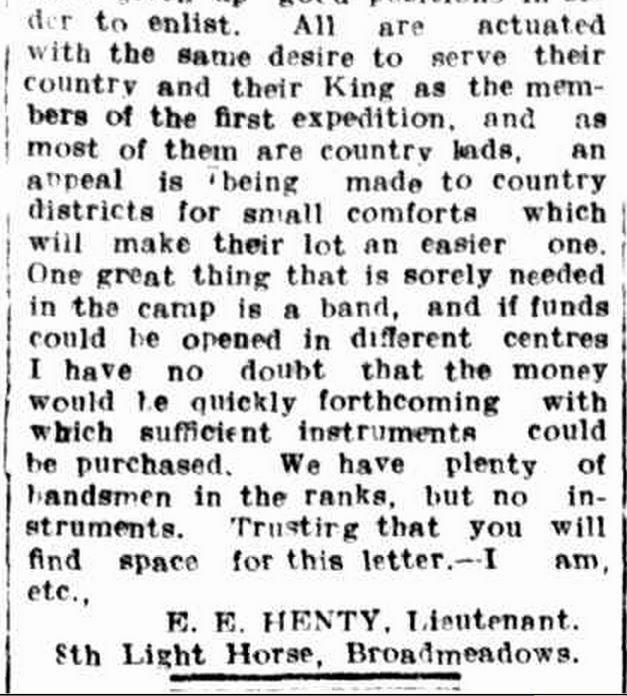 Considering the “Henty Band Appeal”, it can be assumed the instruments were bought with the aid of the people of Hamilton. While in camp, Edward had other matters on his mind, his impending marriage to Florence Grace Pearson, formerly of Adelaide. 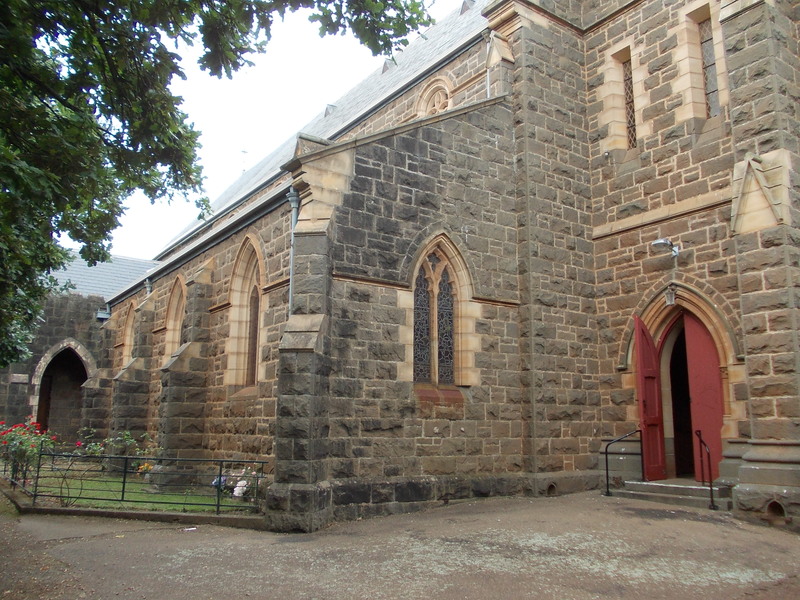 On Wednesday 18 November 1914, the wedding was held at Christ Church, Gray Street and was a large social event for Hamilton. A handsome couple they would have made with Florence wearing a robe of crêpe de chine and a tulle hat and Edward in his officer’s uniform. Their wedding breakfast was held at Bewsall, the home of Edward’s aunt Mrs Stapylton Bree (Annie Marie Henty). Edward’s wedding gift to Florence was a pearl necklet and with some leave available to Edward, the newlyweds left for Portland for a few precious days together. Edward returned to the Broadmeadows camp and continued preparations for the regiment’s departure overseas. He was well-liked by the men under him. As a token of respect and possibly thanks for his campaign for the band instruments and comforts, the men chipped in for an engraved silver entrée plate as a wedding present for Florence. Edward was popular with his fellow officers including Elliot Graton, Thomas Redford and Keith Borthwick picture with Edward in the following photographs. Little did they know what lay ahead. The 8th Light Horse sailed on 25 February 1915 for Egypt. 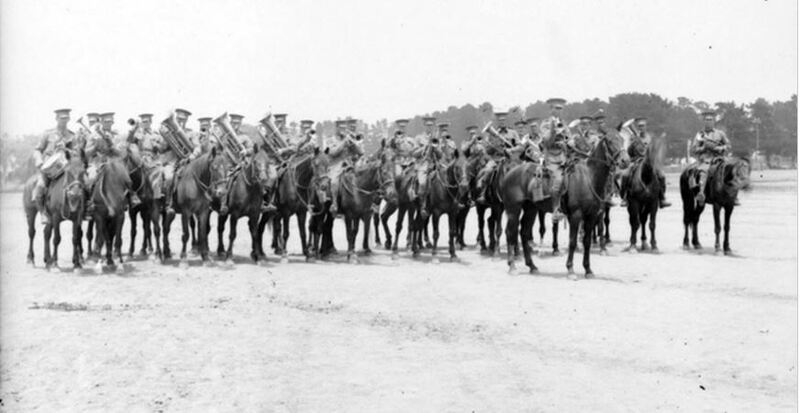 By May, the were to learn they were off to Gallipoli and their horses would stay behind. After almost two months at Gallipoli, Edward was again in Egypt, hospitalised with gastroenteritis but he was back in the trenches two weeks later. On 7 August 1915, the 8th Light Horse Regiment made up the first two waves over the trenches in a battle known as the Charge at The Nek. Edward was in the first wave and was shot dead by machine gun fire. Killed with him were Elliot Graton, Thomas Redford and Keith Borthwick the three men who only months earlier had posed with him for photographs. Edward was buried in the Ari Burnu Cemetery at Gallipoli. John Hamilton’s book “Goodbye Cobber, God Bless: the fatal charge of the Light Horse, Gallipoli” has a letter written by Bunney Nugent from the 8th Light Horse in reply to Edward’s mother Annie. Annie had asked after Edward’s black horses. Bunney replied that he had the “…black mare and will not let anyone ride her” (p.41). Presumably Edward took his own horses, Western District horses who like Edward would never return. 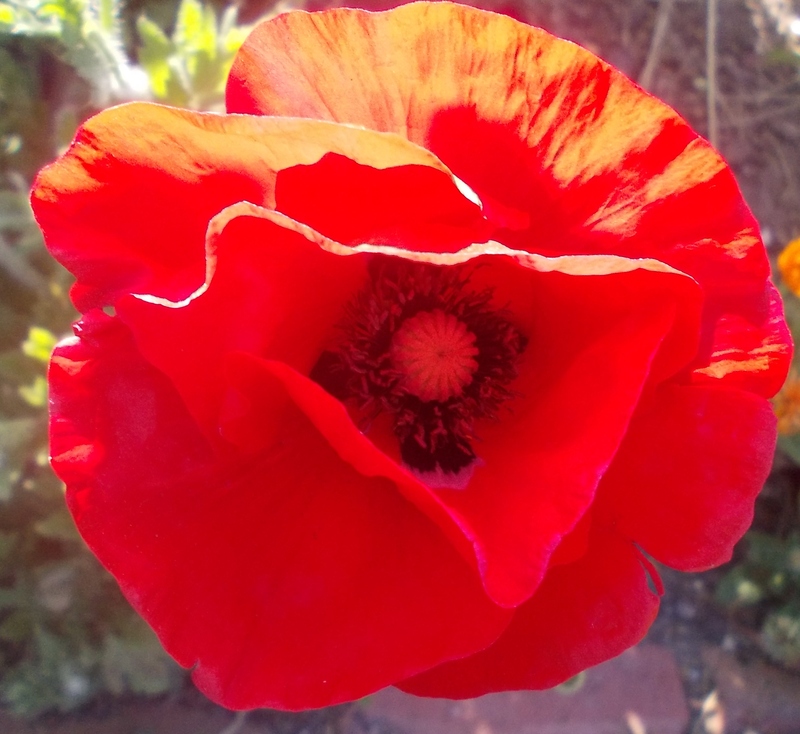 Before departing overseas, if Edward expected to die, charging over a trench and running toward the enemy would not have been how he would have imagined. Rather, charging at a gallop on his black mare from home would have been closer to his expectations. Florence was around six months pregnant and living at the Henty home The Caves when she received the news. Word soon spread throughout the district of the loss of one of Hamilton’s finest. “AUSTRALIA’S HEROES.” Hamilton Spectator (Vic. : 1870 – 1918) 23 Aug 1915: 4. Web. 16 Apr 2015 <http://nla.gov.au/nla.news-article120398698&gt;. Only nine months after passing through the doors of Christ Church, Hamilton for the joyous occasion of his wedding, Edward’s friends again filed through the doors. But as they attended a memorial service for their mate ‘Ted’, their joy had turned to grief. Also, a tablet was unveiled at St. Stephen’s Church, Portland the town of Edward’s birth and heritage. Around ten weeks after Edward’s death, on 21 October 1915, Florence gave birth to a boy. She named him Edward Ellis Henty after the father he never knew. Her baby and a pearl necklet the few reminders of her beloved Ted and their short time together. 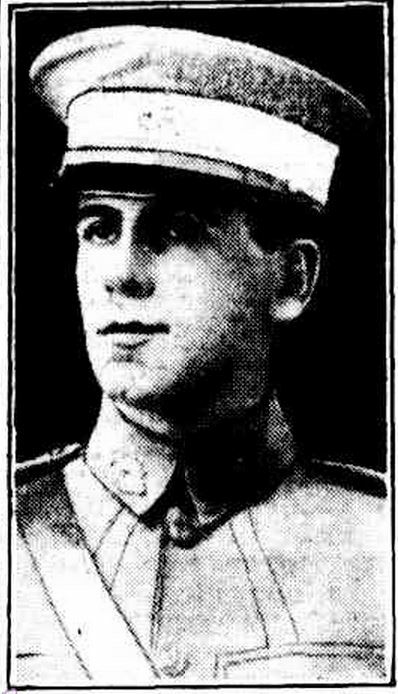 Hamilton, John Goodbye cobber God bless you : the fatal charge of the Light Horse, Gallipoli. Pan MacMillan, Sydney, 2004.